Home / Stories / Speaking documents / What is this strange… thing? In the corridors of the company building in Rome’s Piazza Venezia there is a strange object on display that has aroused much curiosity in visitors, not so much because of its features but because of the extraordinary avant-garde technique employed: it is the ancestor of modern vending machines! More specifically, it is an automatic dispenser of accident insurance policies. Manufactured by the Milan firm Ceretti & Tanfani specialising in the construction of suspended transport, it could be seen in the main Italian railway stations until the 1920s. The dispenser was first shown to the general public at the 1898 Italian General Exposition in Turin by Anonima Infortuni of Milan, a subsidiary of Generali founded in 1896. Linked to the travel ticket, the policy was issued after introducing a ten-cent coin into the dispenser, and was valid for twenty-four hours from the date on which the ticket was issued. The insurance covered any injuries sustained while travelling by train or steamboat. 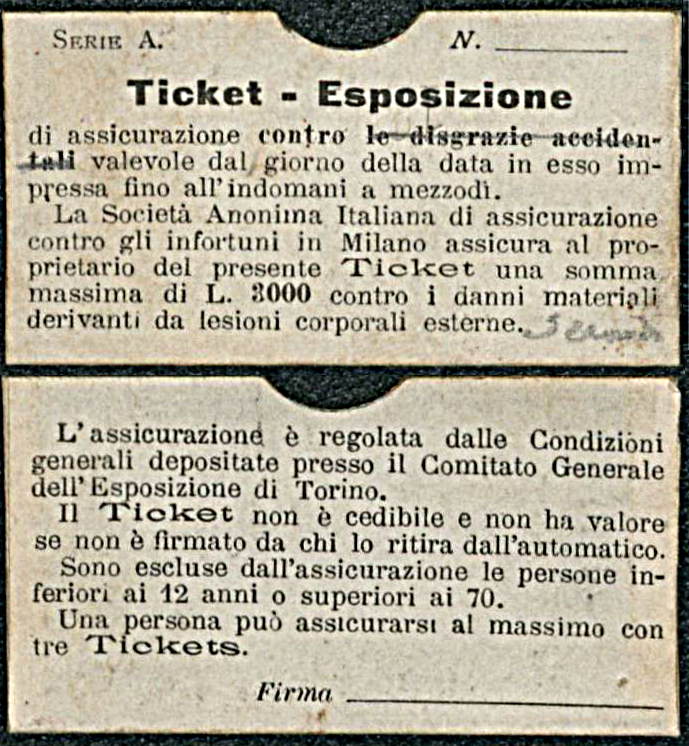 The Trieste Archive still has some of the papers behind this curious memento, also linked to the Turin Exposition, an international exhibition celebrating the fiftieth anniversary of the Albertine Statute: some tickets, policy conditions, brochure and the general plan of the Exposition, as well as the advertising pamphlet of the exhibitor company and related sketches. Simple testimonies, but of great historical value, which show how the great Universal Exhibitions have always been a showcase of the world: opportunities for sharing and comparing experience and technology and precious indices of the degree of development of exhibitors, with their wealth of inventions and authentic marvels.